We sailed a windy path to Skardin and found it is a delightful town. The ACI Marina is just a few hundred yards away from the main square of town by path and bridge. 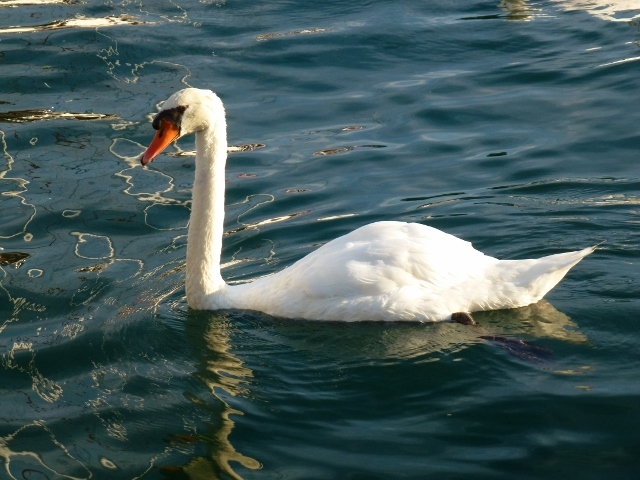 Swans sail in the harbour and in the waters nearby. They are regal, graceful and just as cheeky as seagulls. We needed a view fix and walked up to the fortress, which is not very steep and took photos of the town from the hill. The town is small and a mix of old and new buildings. 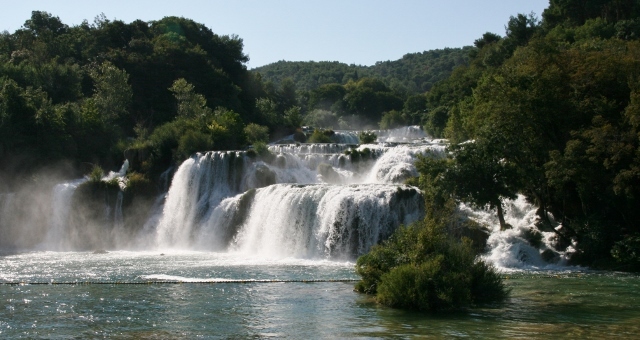 It is the pick-up point for the boats that take you to Krka National Park. 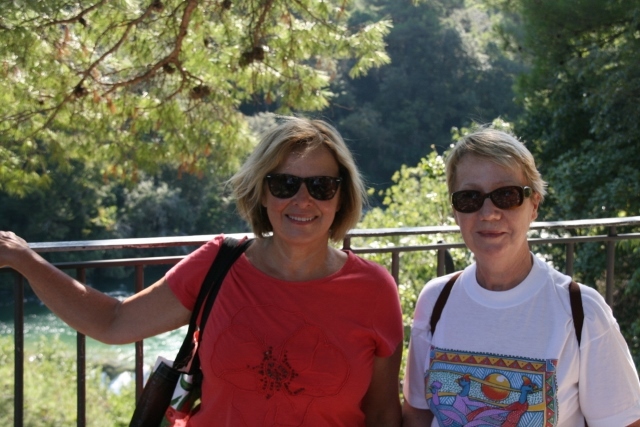 People either drive or come by boat to Skadrin to take the boat up to Krka and its incredible waterfalls and system of paths through rushing water and ponds under a roof of pines, chestnuts and figs. The falls are majestic, a waterfall at one end (see in the photo) and a clear pool running into cascades. We walked up to the source and various look out points. 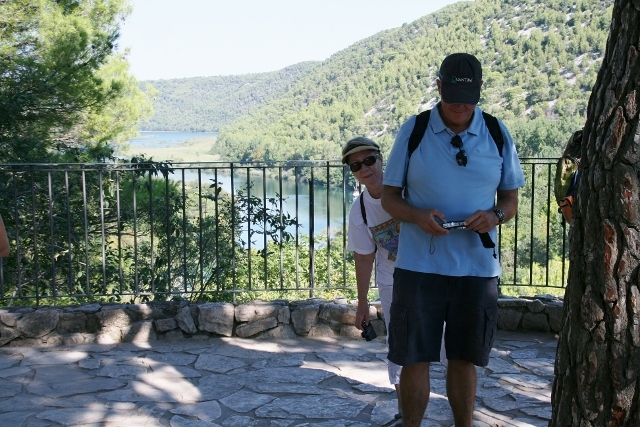 There are rushing flows of water and the paths take you under a canopy of chestnuts, figs and pine. Pine and flowers and figs are all aromatic, very fresh and uplifting. 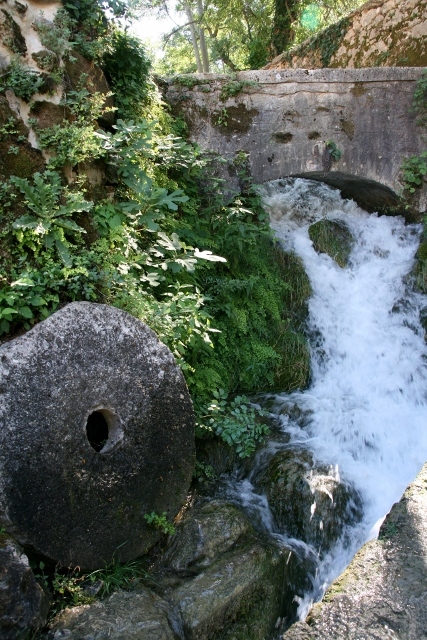 There are also historical artifacts – old churches and mills, rushing water or mill ponds everywhere you turn. Lelsey, James and I wandered for hours. 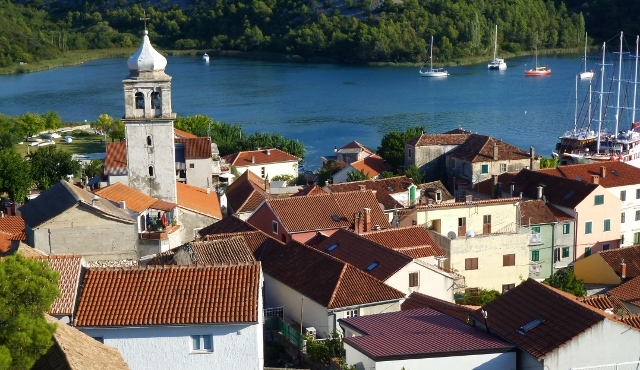 We finished up by taking another excursion boat to the Franciscan Monastery on the man made island of Visovac. It was a small island, entirely picturesque and we enjoyed the grounds as well as the building. They only give you thirty minutes which is simply not enough. We’ll leave you with a photo of this tiny jewel.